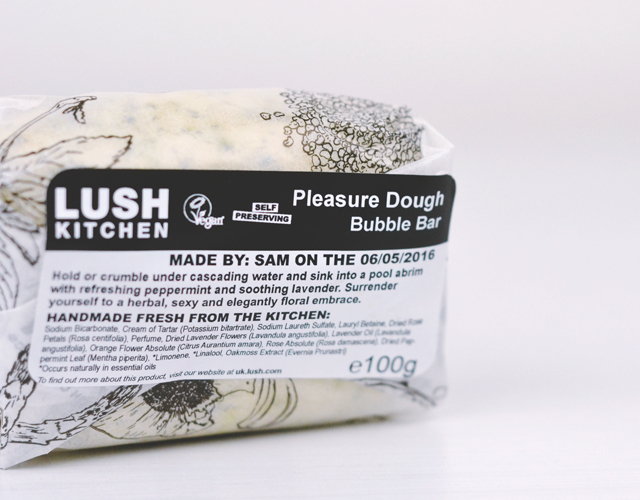 Yes, Pleasure Dough sounds like a euphemism. It's ok to giggle. I did. In actual fact, it's a bubble bar from the Lush Kitchen which I bought on a whim because I wanted a cleanser and resent paying £3.95 delivery for one object. That turned out to be a very good decision as I absolutely love this gorgeous little bar of deliciousness! To be completely honest, I really only chose this bubble bar because of the name. There were others available in the Kitchen at the time but Pleasure Dough won out. I didn't really pay much attention to the ingredients, but there were oranges on the product page so I figured this would be an uplifting, energising experience. Yep, that was wrong! It doesn't even include oranges, satsumas, clementines or any other round orange fruit, so I'm not sure why they chose this image. When the box arrived, I could smell the lavender radiating out of it. This got me excited because lavender is one of my favourite smells ever (aside from chlorine and blown-out candles). As I opened it up, that floral scent got stronger and stronger. I just left the product sitting on my coffee table for a few days as it had such a great throw on it and made the whole room smell incredible. Eventually, I decided to unwrap the bubble bar and gave it a good sniff. There's the aforementioned strong lavender but also more than a hint of peppermint. I love the combination of soothing and refreshing fragrances together- it gave the product a really fresh feel. 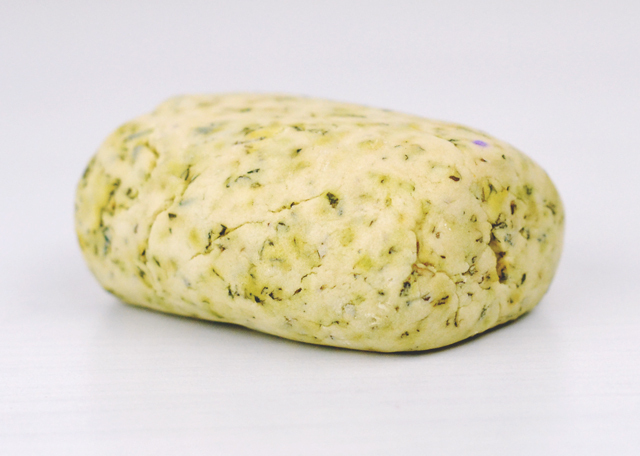 The bubble bar itself is a fairly large, vaguely sausage-shaped product with a dough-coloured base peppered with lavender and mint sprigs. As it's on the larger side, I split it into quarters but, to be honest, I think this was pushing it too far as I didn't get the bubbly experience I like. I'd recommend using a third for each bath if you like a lot of bubbles. Aherm.. Pleasure Dough? *smirk* I think that may be a little too 'scandalous' to ever make its way to the UAE but it sounds incredible. I actually don't mind a messy bath, it certainly wouldn't put me off buying something. I usually go for sweeter scents but with the minty fragrance in this, I think I'd really like it. Might be just me, but the name immediately made me think of the Frankie Goes To Hollywood song 'Welcome To The Pleasuredome'.